At least, that’s the picture you might have of Georgia if you read Saakashvili’s speeches, Western op-eds, Russian liberals like Cato Institute flunky and global warming denier Andrey Illarionov, and a sundry host of Georgian ambassadors and lobbyists shilling for all they’re worth in major Western newspapers. But rhetoric and reality can be two very different things. To what extent do objective indicators (e.g. statistics) bear out this neocon vision of Tbilisi as the shining city on the Caucasian hills? By the numbers… Let’s start with the economy. Saakashvili deserves some credit for maintaining respectable GDP growth rates, albeit they are far from the awe-inspiring figures of China or, for that matter, several other post-Soviet republics. From 2004 to 2011, the Georgian economy grew at an average of 6.0% per annum, which is only modestly higher than Russia’s 4.5%. However, this comparison becomes much more unfavorable once Georgian growth is adjusted for other factors. First, Russia is already much richer than Georgia – its GDP, however you measure it, is more than three times higher – so by basic economic theory, ceteris paribus its growth rate should be much higher as poorer countries have many more easy opportunities to increase productivity. (Illarionov, by the way, is ignorant of convergence theory, a fairly basic macroeconomic concept; it’s frightening that this “economist”, who is more accurately a libertarian ideologue, was once a major economic adviser to the Russian government). 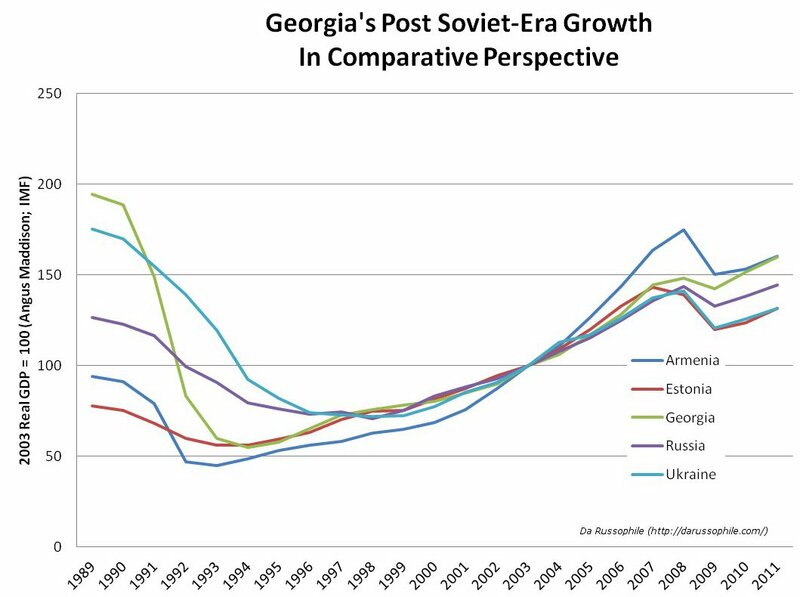 Second, Georgia had by far the biggest and sharpest decline in GDP during the early 1990’s of all the Soviet republics, and even as of this year, its gross output is still 20% below the peak levels of 1989. 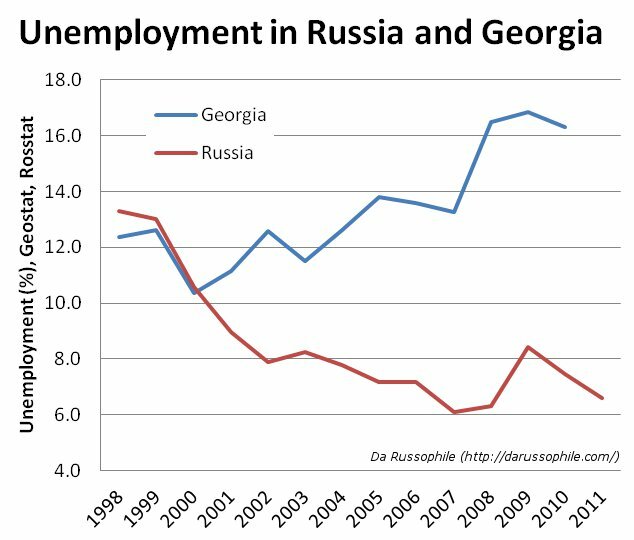 This should also, in principle, help Georgia grow much faster than Russia – which surpassed its peak Soviet-era output sometime in the mid-2000’s – because in a sense it is still “recovering” from an economic depression. A much more appropriate comparison would be with Armenia. Both are in the unstable Caucasus region. Georgia has intermittently faced sanctions from Russia, whereas Armenia is under permanent economic blockade from Turkey and Azerbaijan. Unlike Azerbaijan, neither Tbilisi nor Yerevan enjoy an oil windfall. Their GDP per capita is almost exactly the same: About $3000 nominal, and $5000 in purchasing power adjusted dollars. Unlike Georgia, Armenia has recovered its Soviet-era production levels and then some; its GDP is now more than 50% as big as in 1989, so it is well past the period of mere “recovery growth”. Both countries suffered from destructive wars in the early 1990’s, and both remain highly militarized to this day. Nonetheless, with the exception of the past three years, when it was crushed by the economic crisis, Armenia has consistently clocked up higher GDP growth rates than Georgia. In sum terms, during the 2004-2011 period, both countries grew at approximately the same pace: 6.0% for Georgia, 6.3% for Armenia. In the graph above, GDP per capita is indexed to 100 at 2003 for a range of post-Soviet countries. It is clear that Estonia and Armenia, despite their deep recent recessions, are highly successful transition economies; both are a lot more prosperous now than in 1989. Russia is only moderately successful. Along with Ukraine, Georgia is still well below Soviet-era peak output levels, and its growth under Saakashvili wasn’t exceptional by the standards of other post-Soviet republics, despite its twin advantages of starting from a low base (unlike Russia, Estonia) and still being in the process of recovering lost output (unlike Armenia). Another relevant comparison is with the “corrupt” and “nepotistic” Shevardnadze administration from 1995-2003, which was overthrown to great fanfare in the “Rose Revolution”. What was Georgia’s growth rate then? 5.9%. That is within rounding error of growth under Saakashvili. It should furthermore be noted that growth was accelerating throughout Shevardnadze’s Presidency, reaching a peak of 11.1% in 2003. So there are valid questions as to the extent the high growth rates of the early Saakashvili Presidency were due to his neoliberal reforms. What about life for ordinary people? There is no doubt that the average Georgian became significantly better off, as was the case everywhere in the former USSR during this period. 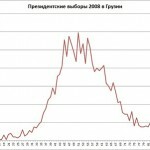 Georgian statistics show nominal wages almost quadrupling from 2004-2010, from 157 lari to 598 lari per month, albeit adjusting for inflation would reduce it to only a bit better than a doubling. However, higher wages can only be enjoyed by people who actually get them. During the same period, unemployment grew from 12.6% to 16.3%. Despite neoliberal reforms that undercut the bargaining power of labor, unemployment in Georgian urban areas – approaching 40% in the capital, Tbilisi – is now as prevalent as in the most impoverished provinces of the Russian Caucasus. About half of the Georgian labor force is “self-employed” in sustenance farming, which is a higher figure than two decades ago. In contrast, unemployment in both neighboring Armenia, and “corrupt” and “stagnating” Russia is around 6%-7%. 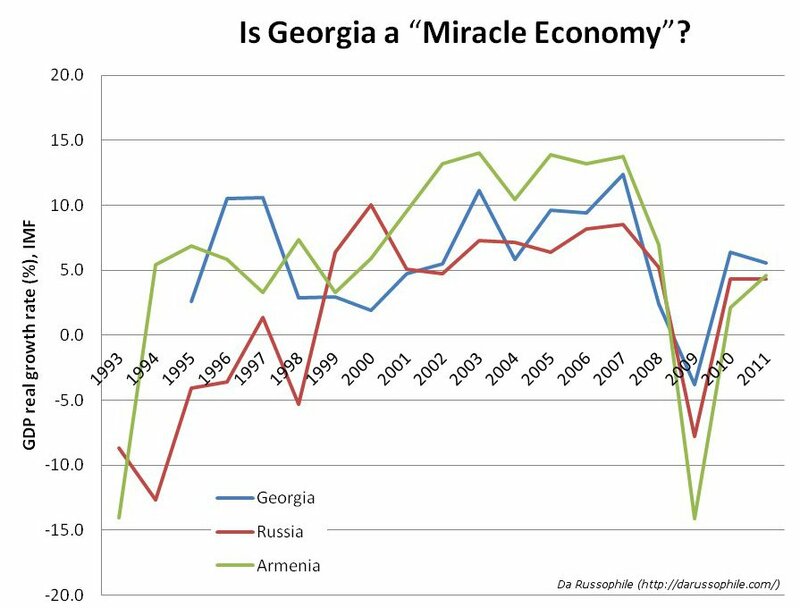 So bearing in mind actual statistics, does Georgia still deserve the status of a “miracle economy” conferred to it by libertarians and neocons? Don’t get me wrong, 6% is not bad. It’s no worse than under (maligned) Shevardnadze, and modestly better than the 4% average growth rates observed in Moldova, the very worst performer in the entire post-Soviet space. But even so, Georgia is not going to catch up with the developed world at its current pace of development – not like China, which has comparable income levels but is growing at 10% rates, or Russia, which is already three to four times richer. Moving on, Georgia has also been lauded for excoriating previously endemic corruption, and becoming one of the world’s most “economically free” and business-friendly locations. The latter may well be true; objective ratings such as the World Bank’s Ease of Doing Business, which measure the number of days and permission slips required to start a business, place Georgia 16th globally. This seems a genuine achievement, albeit as real world data shows, these things have at best only a marginal influence on economic growth rates, which are primarily determined by a country’s initial development level relative to the quality of its educational human capital. On the Corruption Perceptions Index, Georgia improved its score from 1.8 in 2003 to 4.1 by 2011, which is a very significant change (in contrast, Russia languishes at 2.4, and Armenia at 2.6). But some Georgian businesses report government agents demanding political “donations” to Saakashvili’s ruling party to avert hostile raids, and in any case it must be borne in mind that the CPI is a proxy of corruption perceptions, not corruption realities per se. The CPI rating can thus be unduly influenced by good PR and lobbying. As a Western-trained lawyer, Saakashvili appreciates their importance, and has over the years paid millions of dollars to PR firms like Aspect Consulting, Orion Strategies, Public Strategies, and the Glover Park Group to burnish Georgia’s reformist, anti-corruption and democratic image abroad. Other indicators that are not as reliant on the perceptions of anonymous experts show a somewhat different picture. In the Global Integrity Report, which is based on blind review, Georgia does only modestly better than Russia, scoring 76/100 as compared to Moscow’s 71/100. On the Open Budget Index, which assesses the transparency of government accounts, Russia actually does better, scoring 60/100 to Georgia’s 55/100. And according to Transparency International, the same outfit behind the CPI, the percentage of Georgians who reported paying a bribe in the past year in 2004 was only 6%; as of 2010, this had declined to 3%. A positive and appreciable change to be sure, but the data indicates that petty corruption was not that much of a problem in Georgia to start off with. Didn’t Saakashvili at least democratize Georgia? Well, no. The fact of the matter is that Georgia was already a democracy under Shevardnadze, if a highly imperfect and illiberal one. The same remains true today. Unofficial protests are brutally broken up, independent TV stations have their licenses revoked, and opposition figures have their citizenships canceled or forced into exile abroad. Georgia has also become a revisionist and highly nationalist power under the charismatic President, whose actions have ranged from the petty and incompetent, e.g. blowing up a Soviet war memorial to Georgian war dead, and in the process killing a mother and her daughter in the blast, to the criminally deranged and incompetent, e.g. the invasion of South Ossetia and carpet bombing of Tskhinvali, even though virtually no Ossetian wants to live in a Greater Georgia. If one doubts that Saakashvili is in fact rather far from being a nice liberal democrat, all one has to do is look at the indicators of political freedoms. In the Polity IV rankings, the most comprehensive democracy indicators database assembled by political scientists, Georgia increased from 5/10 to 6/10 on a scale from -10 (zero democracy) to 10 (full democracy) under Saakashvili. This is hardly the glorious transformation the Rose Revolution is often made out to be; nor is it very much different from the Evil Empire’s. Russia’s current score is 4/10, for whatever reason down from 6/10 after Medvedev’s election in 2008. There are however two socio-economic indicators under Saakashvili that did register highly visible, concrete changes. If not for the better. From 36% in 1991, the tertiary enrollment rate remained steady until the late 1990′s, when it began to grow, reaching 43% by 2003 and peaking at 47% in 2005. Then it plummeted to 25% by 2009, edging up to 28% in 2010. This seems to have been in substantial part due to an increase in the cost of annual university tuition from 500-600 lari in 2003 to 3000-4000 lari by 2009, an eight-fold increase far exceeding the quadrupling of salaries during the same period (even disregarding increased unemployment). Bearing in mind that the average salary was 557 lari in 2009, it is clear that for many families university education became unaffordable. Government grants have also plummeted: From wholly financing the educations of 9,700 students in 2003, by 2009 they were subsidizing only half the tuition costs of 1,000 students. University access has dropped by more than 80% in some regions. This is particularly catastrophic for Georgia because international student assessments indicate that their schools are almost useless at imparting real world skills. According to PISA 2009, only “31% of [Georgian] students are proficient in mathematics at least to the baseline level at which they begin to demonstrate the kind of skills that enable them to use mathematics in ways that are considered fundamental for their future development.” The equivalent figure for Russia was 72%, and about 78% for the OECD as a whole. On Reading, Math, and Science, Georgian students came, respectively, 67th, 66th, and 70th out of the 75 countries in the PISA assessment. Other international student assessments paint a similarly dire picture. For instance, in TIMMS 2007, Georgian students got an average score of 410 in the Math component, relative to Armenia’s 499 and Russia’s 512. The gap is not substantially different in the Science component, or in the PIRLS 2006 literacy survey. This is unlikely to improve any time soon, as under Saakashvili, the number of public libraries more than halved. While Georgia was disinvesting in its future workforce, tertiary enrollment has risen in Georgia’s neighbors. 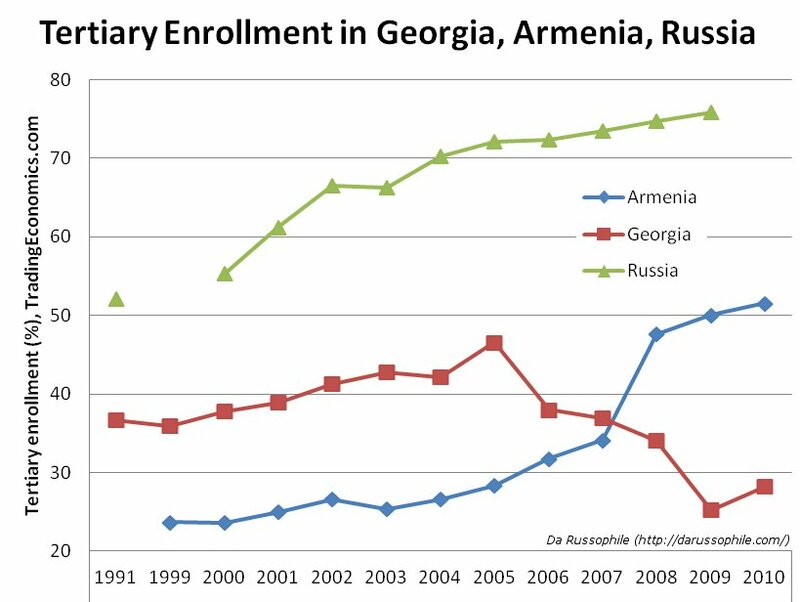 In Armenia, it rose from 24% in 1998 to 52% by 2010; the percentage of Russians undergoing university education rose from 55% in 2000 to 76% by 2009. That is because the leaderships of these countries, as in much of the rest of the civilized world, appreciate the importance of human capital to fostering economic growth. In Saakashvili’s world, presumably, praying to the souls of Hayek, Mises and Rothbard would suffice. More education is the road to serfdom. But in the end, I guess it’s all a matter of priorities. The Georgian army and police are now well fed. Who needs math, science, and literacy anyway? “Military-patriotic education means training in civil defense,” Saakashvili says, “Stimulating soldierly spirit, which historically was always in nature of people in Georgia; as well as courses in Georgia’s military history” is what is really important. Hear hear? Meanwhile, the prison population has tripled from 182/100,000 in 2004, to 536/100,000 in 2011. Under Saakashvili’s democratic guidance, Georgia has acquired the dubious distinction of being the European country with the most prisoners per capita, displacing Russia (the irony!) in the process. This is not to say that Georgia is a corrupt, stagnant tinpot dictatorship, its tottering foundations stabilized by huge inflows of American capital (though the latter sums, ranging in the billions, are very substantial relative to the tiny size of the Georgian economy). Saakashvili has maintained a mediocre level of economic growth, wages have risen substantially, and corruption has been reduced. Nonetheless, its performance is far less impressive than that of a comparable neighbor, Armenia, and on almost every socio-economic indicator it massively lags Russia. It is a democracy, but the quality of its democracy is not substantially better than that of Russia, which countless Western pundits describe as an authoritarian kleptocracy returning to the USSR. In place of building the foundations for sustained long-term growth, Saakashvili has instead been busy undermining what little of it exists. No amount of reforms to make life easier for capitalists can compensate for the abysmal quality of the Georgian education system, and Saakashvili’s wanton curtailment of the only partial remedy for it, university access. He is at essence a blowhard, passable perhaps as a mercenary lawyer, but utterly unqualified for the work of statesmanship. He pontificates about building huge new cities on swampland (complete with “seven star hotels”), demands Slavic countries stop calling his country “Gruzia” as they have done for centuries, and arrests Russian tourists who dare holiday in his country for the mere suspicion of having passed through breakaway Abkhazia. Russian language schools are closed down, and the main Tbilisi boulevard is renamed in honor of G.W. Bush, while the latter was still President to boot! 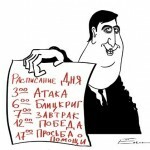 What emerges of Saakashvili is a small, petty and vainglorious man, who blames all of Georgia’s problems on his “Mongoloid” northern neighbor and deflects all criticism of his ham-fisted rule by arresting the critics as Russian spies. He presides over “Potemkin Georgia”*, hyped as a tiger economy of the Caucasus by ideologues and paid-up PR men, but in reality fast becoming an isolated Cuba of the Caucasus. If the good people of Georgia accede to this, it is of course their right as a sovereign people. It is also understandable that neocons who appreciate his irrevocably pro-Western science, libertarians dreaming of culling labor laws and defunding public services, sundry Russophobes operating on an the-enemy-of-my-enemy-is-my-friend basis, and plain paid-up PR men would defend Saakashvili’s record. But it is also then incumbent on people of honesty and integrity to publicize the lies of his apologists (Andrey Illarionov, David Hamilton, Garry Kasparov, Valeriya Novodvorskaya and Vladimir Bukovsky, Giorgi Badridze, Randy Scheunemann, Jennifer Rubin, Eli Lake, Melik Kalyan, etc), and continue revealing Saakashvili for what he really is – an emperor with no clothes. Because even if Saakashvili is hellbent on undermining the future of his own country, he should not be allowed to do the same again to Abkhazia or South Ossetia – or for Potemkin Georgia to be portrayed as a model of good and effective governance for other countries to follow. * Yes, I’m aware that “Potemkin villages” are probably a historical urban legend. But as the term is regularly and uncritically used as regards Russia in the Western press, I don’t see the problem in turning the tables on them.